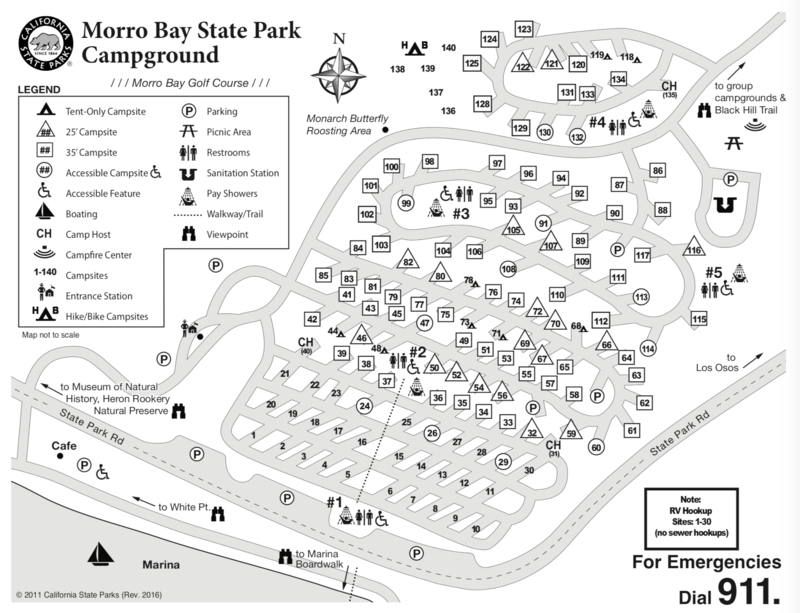 Morro Bay State Park campground has 134 campsites for tents, trailers and RVs (up to 35 feet) with 27 sites having electric/water hookups. Each campsite also has a paved parking spur, a table, fire ring, grate and food locker. Some sites are designated hike/bike campsites. There are also 12 ADA accessible sites. Campsites can accommodate two vehicles (trailer counts as one) and 8 people. There are 2 group campsites, Chorro (35 people) and Osos (25 people). The campground has a campfire center, picnic area, restrooms with flush toilets and hot showers, outdoor showers (hot water – token operated), drinking water, overflow parking and an RV dump station. The Bayside Cafe is also located next to the campground. Morro Bay State Park offers visitors a chance to view and explore a beautiful lagoon, saltwater marsh and natural bay habitat. Photographers will also love the opportunity to get shots of the famous Morro Rock. The park also has a boat ramp, boat rentals, an 18-hole golf course, hiking trails, food service, museums and various exhibits and programs. Outdoor recreation includes biking, hiking, boating, kayaking, surf-fishing, swimming, windsurfing, surfing, geocaching and picnicking. Wildlife viewing is also really nice here. Two other campgrounds in the area include Morro Strand State Beach and Montana de Oro State Park. Visted Morro Bay State Park Campground lately? We'd love to hear about your adventure. Did you find us useful? Did we forget something? 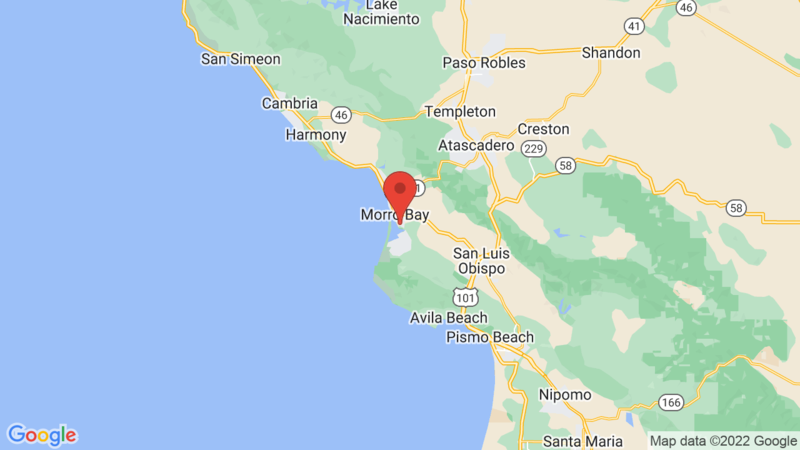 Anything our community should know before heading out to Morro Bay State Park? CampsitePhotos.com is not associated with the campgrounds on our site. We provide the photos, some campground info and a link to make a reservation. You can stay up to 30 days, but you’ll need to check with ReserveCalifornia.com for availability and rates: (800) 444-PARK (7275). We are staying at Islay Creek Campground in a few days. Is it possible to use the Morro Bay state beach campground overflow parking for some of our vehicles? There is not a camp store at the campground, and yes – there are a few parking spots over by the shower. You can purchase a token at the campground – either at the shower or at the ranger station. HI Christine, Yes your popup trailer and pickup will fit in site 78 at Morro Bay State Park. You may need to park your popup all the way back and parallel park your pickup on the parking pad, but they will both fit. Morro Bay State Park campsites will accommodate up to 2 vehicles (trailer counts as one) and 8 people. You can not park a car, trailer and an RV in one site. Most sites can accommodate a car/trailer or motorhome up to 35 feet. Some sites are a tad smaller.